The 2012 EP from the band I am currently performing in available on Lujo Records.Features layered percussion, glassy synths and driving, pummeling bass. A Lull’s Meat Mountain signifies new freshness, growth and maturity. The Chicago-based band is always changing, trying to evolve from what it was, into something exciting and new. During the recording of Meat Mountain, the quintet sought to achieve more by using less. While previous recordings often relied on creating “walls of sound,” Meat Mountain employs open space as an instrument as well. Most of the core instrumentation was written live, recording demos, rehashing and rebuilding. The band continued to diversify its sound by discovering synth tones that seemed to almost feel like throwback sounds, but new all the same. There was more experimentation with elements such as saxophone solos, flute riffs and even cymbals into the recordings for the first time. The resulting music therein is more sincere and more transparent in Meat Mountain than any of A Lull’s previous work. After extensive touring throughout 2011 and early 2012 with bands such as Cold War Kids and Gauntlet Hair and the release of A Lull’s debut full length album, 2011′s Confetti, the band dedicated time in early 2012 to record five new songs. The EP was written, recorded, produced & mixed by the band. Recorded in the unseasonably mild winter months of Chicago in 2012, the songs feel warm, rambunctious and full of warmth and summer. The songs feel tighter, while organic poly-rhythms lend clarity and life to the music. Lyrically, Nigel Evan Dennis sings of simpler things. A woman wearing a summer dress, crooning, the dichotomy between fascination with and the distance from the super models that we idolize. He sings of fighting and friends. Meanwhile, a some other songs tread into darker territory with ruminations on the thought of what it would be like to be kidnapped and the terrifying notion of serial killers and creative inadequacy. Lyrically, the songs of Meat Mountain create pictures of scenes, fears, obsessions, love and longing. 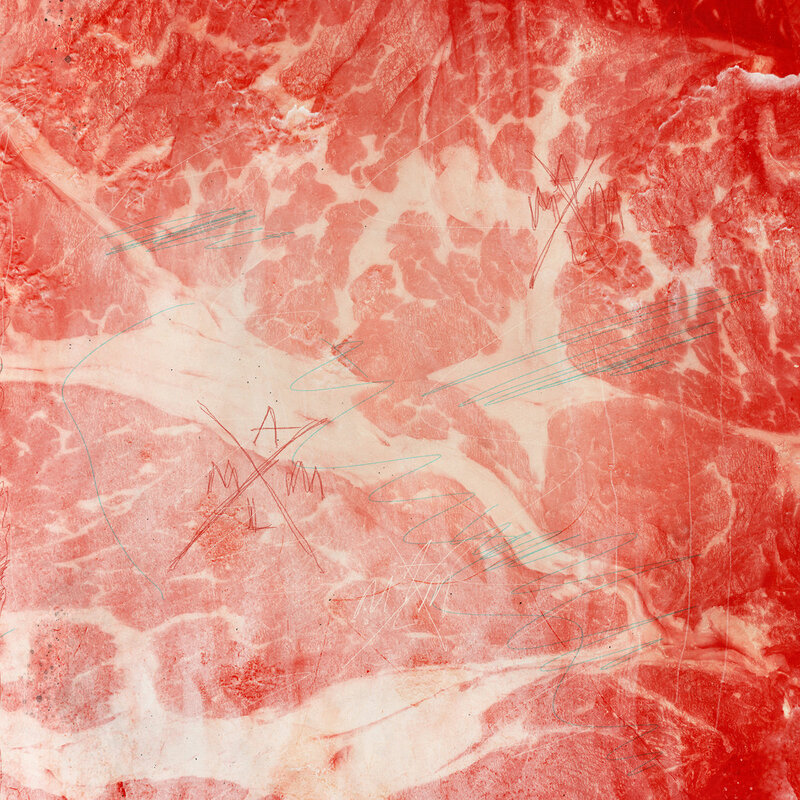 The album artwork was created by scanning a chuck-eye cut of steak. The steak was then cooked to medium doneness and eaten. The artwork for the EP is an attempt at being every bit as iconic as unique. Utilizing illustrations by Bill Connors, the art matches the overall feeling and aesthetic of the EP, somethings that are hopeful, somethings that we are all scared of and something things that are a part of everyday life. Released on single-sided LP, the package was meant to be seen in this scale. Lujo Records © 2012 Unauthorized duplication is a violation of applicable laws and subject to prosection. All songs & arrangements written by Nigel Evan Dennis, Todd Miller, Mike Brown, Ashwin Deepankar & Aaron Vincel.